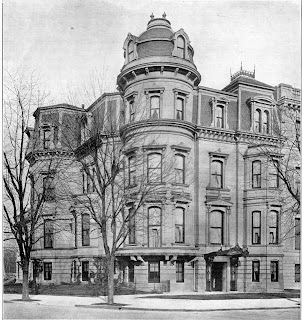 The prominent and distinctive corner house on the southwest corner of Connecticut Avenue and Hillyer Place at 1614 20th Street was completed and purchased in 1893 by a wealthy businessman Alfred S. Gillett. 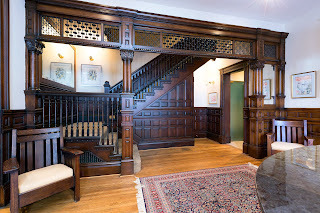 He purchased the spacious townhouse at the advanced age of 75, and lived there along with his second wife, the former Ella Gratz, following a long and distinguished career in the insurance business. Gillett had been born in Hebron, Connecticut on March 17, 1818, the son of reverend Nathan Gillett and Lydia Jones. 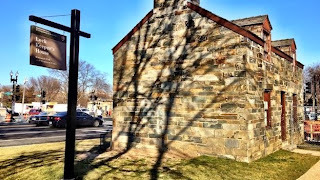 Both his paternal and fraternal ancestors were early colonists of America, arriving before 1700, many of whom participated in building the block houses in Windsor, Connecticut to defend the inhabitants against the Native Americans and the French. 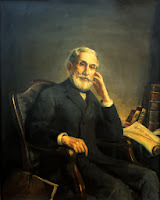 As a young man, Alfred Gillett lived in western New York for a time, before returning to Connecticut to study business and join his brother in a counting (accounting) house. In 1837, he took an opportunity to move to Georgia to work for a large counting business, where he amassed a large amount of various merchandise which he emigrated with to Texas in 1840; realizing handsome profits from its sale in that emerging State. There, became close friends with the republic’s president, Samuel Houston. Gillett first married the former Martha Fuller in 1841; they had two children that died in childhood, and Martha Fuller herself died in 1880. A short time afterwards, on January17, 1843, Gillet was appointed a postmaster at Haynesville, Georgia. There he remained until 1847, when “the discontent and animosity which finally culminated in the civil war made it uncomfortable for a man of his temperament and determination, familiar with having ties which strongly bound him to both North and South” returned to New England. He is pictured at right. Gillett’s second wife was the former Ella Gratz, the daughter of well known Philadelphian merchant Edward Gratz. They married in 1883, when Gillett was aged 65; with a thirty-seven year difference in their age, Ella having been born in Pennsylvania about 1855. The Gillett’s were well traveled for the era, “and there is hardly a spot in the United States of interest that he has not visited.” In 1893, they purchased and moved into 1614 20th Street. The 1910 census shows that the Gillett’s then lived at the house along with four white servants, including a twenty-one year old chauffeur named Edward Byron, a Washington native. The three others had all been born in Ireland, and included maid Mary Elynn, 28; cook Teresa McGinn, 40; and ‘waitress’ Sarah McKinney, 24. The Gillett’s had three homes altogether, including 1614 20th Street. They maintained a lavish and well landscaped 200 acre farm they called “Evergreen Lodge” outside Leesburg, Virginia “brought to the highest state of cultivation under his supervision,” that included a colonial era farmhouse. In the summer months, the couple traveled north to their seasonal retreat coined “The Hermitage,” near Wallingford, Pennsylvania that had been built in the 1840s, and remodeled in the 1870s, which remain today. A brief biological entry in the 1903 City of Washington stated that “Mr. Gillett is replete with many charming anecdotes of the western life of those troublous times, and although he has considerably passed his fourscore years, he is a rare raconteur, his mind active and alert, supplemented by a keen sense of the ridiculous, which cannot fail to charm his listeners.” He died in 1914 at the age of 96. Following a period of commercial uses in the 1760s and 1970s, the house at 1614 20th Street was owned today by the founders of the Sprenger & Lang law firm. It was recently listed for sale via Sotheby's Realty for $6.8 million by agent Michael Rankin. Recent pictures via the listing at HomeVisit.com. The Hahnemann Memorial on the eastern edge of Scott Circle often goes overlooked in a city full of such memorials, but its dedication to an intriguing German physician named Dr. Samuel Hahnemann and its outstanding design elements should make it a summer destination for residents and visitors alike. After all, not many of this city’s memorials and statues were actually designed to be sat upon. Its dedication took place on June 21, 1900, the culmination of nearly ten years of committees and the donated funds from 2,500 persons throughout the world whose names were planned to have been inscribed in its granite base. 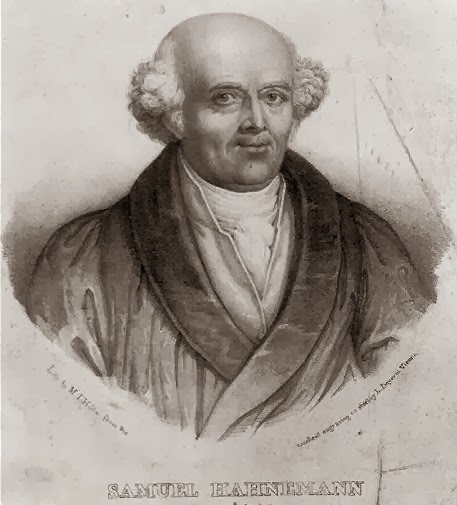 Hahnemann (1755-1843) was a German physician who advocated homeopathic medicine, much to the consternation of pharmacists during his lifetime, since he argued that patients benefited from much smaller doses of drugs than were customarily prescribed. The life sized bronze sculpture of Dr. Hahnemann and accompanying mosaic were created by Charles Henry Niehaus, an Ohio native born of German parentage. Born in 1855, he was a graduate of the Royal Academy in Munich, after which he returned to New York in 1885 to establish his studio. He had won a contest for the commission, beating 30 sculptors who had submitted designs. He had worked on the likeness of Hahnemann from a bust by David D'Angers, now in the Hospital St. Jacques in Paris. Following his work on the Hahnemann memorial, in 1912, he witnessed the dedication of his sculpture of John Paul Jones at Independence Avenue and 17th Street, N.W. The architect of the white granite base, which includes a Greek exedra, or curving bench, was Julius F. Harder. He had been born in 1865 in New Haven, Connecticut, and moved to New York in 1886 to work as a draftsman and to pursue studies in the sciences; only three years later, the Architectural League of New York awarded him its gold medal. In the early 1890s, Harder was employed by the famed World's Fair in Chicago. Dr. James H. Mc Clelland of Pittsburgh first proposed the monument at a meeting of the Homeopathic Medical Society in 1881, but finally persuaded the American Institute of Homeopathy to undertake the project in June of 1892. The growing homeopathic community supported the effort, donating as little as 25 cents toward the effort, and as much as $4,510.00, given by physician Nancy T. Williams of Augusta, ME. It was constructed by the United States Army Engineer Corps under the watchful eye of Colonel Theodore A. Bingham. Christian Friederich Samuel Hahnemann, son of a porcelain painter, was born in Germany in 1755, and led an extraordinary life. At the age of twenty, he was a thorough master of six languages, including German, French, English, Italian, Latin and Greek, and subsequently became proficient in Arabic, Syriac, Chaldaic and Hebrew. His medical studies were pursued at Erlangen in the year 1779, and he became a member of various scientific societies in Leipzig and other cities. While yet a young man, he was made Surgeon-in-chief of the hospital at Dresden, and later was made Superintendent of the Insane Asylum at Goergenthal, where he inaugurated the mild and humane methods of treating the insane which prevail to this day. In 1812, he was admitted to the Faculty of Medicine in the University of Leipzig, where he lectured for many years. As a result of his daily experience and observation in hospitals, he became skeptical of the eras medical methods, and vigorously set forth his objections in the medical journals of the time, which brought the wrath of those in medical authority. In particular, he theorized that many patients were simply over medicated. Hahnemann also came to the conclusion that “there was a constant relation between the action of drugs and the effects of disease on the human organism, and that this relationship consisted of a similarity of the drug effects on the healthy to those produced by disease in the sick” which laid the basis for the groundbreaking idea of treating disease in the human body with miniscule amounts of the disease itself, in order for the body to produce a resistance; today’s practice of immunization and vaccination. His views at the time were not popular, however, mainly led in opposition by the pharmacists and doctors, both who stood to profit from the sale and administration of drugs. Among other things, Hahnemann even experimented on himself with Peruvian bark! In 1821, he was forced to leave Leipzig and live the remainder of his life in Paris. It is said that people flocked from all parts of Europe to be under his care, and that his clientele included many of the noblest families of Europe. He died there on July 2, 1843, at age 89. 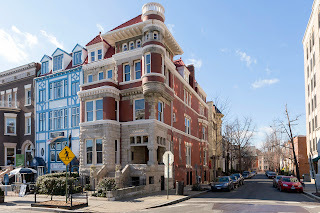 Coined ‘homeopathy’ early in its years of formation, Washington had its own Homeopathic Hospital, located not far from the future site of the memorial, on the southeast corner of 2nd and N Street, N.W. Among the proponents of homeopathy were John D. Rockefeller and Mark Twain. The memorial itself is curvilinear, featuring the bronze likeness of Hahnemann in the center, under a domed glazed mosaic composed of the foliage and flower of the cinchona plant. The statues base includes the inscription “SIMILIA SIMILIBUS CURENTUR,” or “ Likes Are Cured By Likes,” the founding principal of homeopathy and his law of similars. The foundations and superstructure of the Monument were built of white granite from the quarries of the Maine and New Hampshire Granite Company. The dates of erection appear across the center in Roman numerals and the dates of Hahnemann's birth and death, encircled with laurel wreaths, are inscribed to the right and left. Below the inscription of Hahnemann’s name had been a fountain designed in the form of a fluted basin, fed by a stream of running water from a carved dolphin. The statue itself, in standard bronze, was cast by the Gorham Manufacturing Company. Commemorative bronze tablets were placed in two panels, on either side of the statue, representing in bas-relief the four epoch-making periods of Hahnemann's life: the nightly vigils of the student; the investigations of the chemist; the self-sacrificing experiments of the great discoverer; and to commemorate the brilliant success of his treatment of the typhus patients in the hospitals at Leipzig. 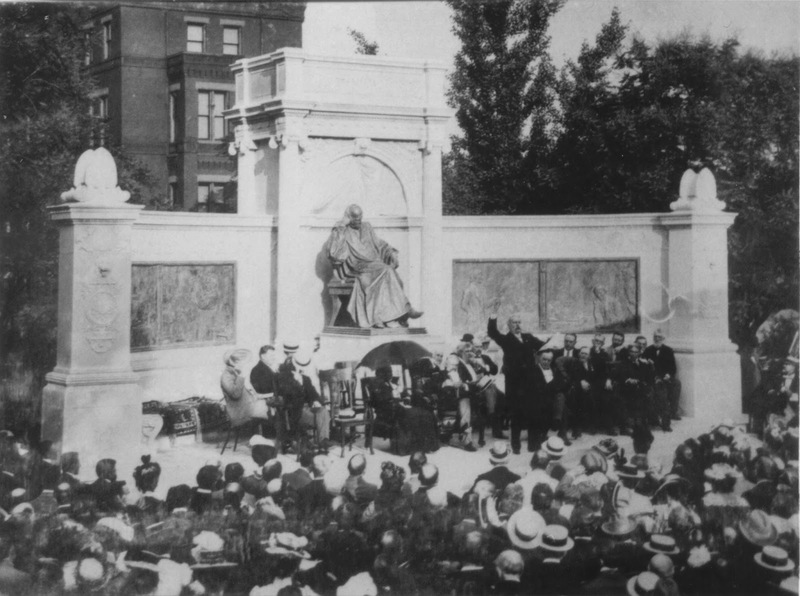 The Hahnemann memorial was rededicated by the American Institute of Homeopathy 100 years after its completion, on June 21, 2000, in which a campaign was begun to raise much needed funds for its repair. In the early years of the United States, there was great interest in creating canals within cities emulating European counterparts. These were not for aesthetics, but for commerce. Pierre Charles L’Enfant included one in his design for the Capital City, but Commissioners in 1792 deemed it too expensive to construct. A lottery held in 1796 to raise funds for its construction was unsuccessful. In 1802, Congress granted a charter for the Washington Canal Company, and construction began in several portions of the planned route. 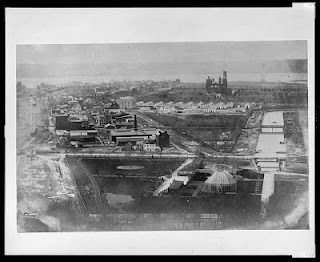 The canal was to connect the Anacostia River (then known as the Eastern Branch), which was navigable into Maryland, with the Potomac, which was seen as a gateway to the West. It would later connect to the C&O Canal. Work at the beginning was slow and arduous. Congress created a new canal company in 1809 when the original had little to show for its effort, and funded it with $100,000. A groundbreaking ceremony with President James Madison took place on May 2, 1810 in southeast Washington. Construction commenced, but was suspended during the War of 1812. The canal opened to much fanfare in November of 1815. 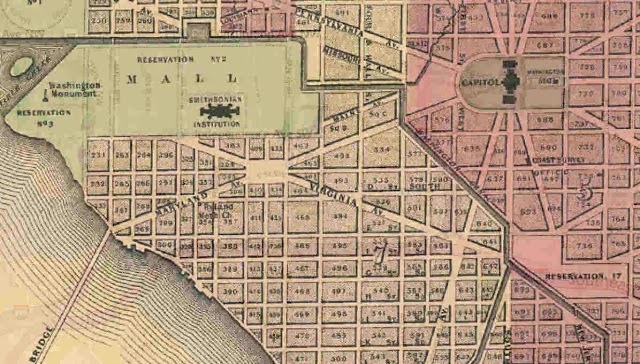 It stretched from an entrance point near the Washington Navy Yard, proceeded north and west with several branches including James and Tiber creeks, and ran westerly exactly where Constitution Avenue exists today. 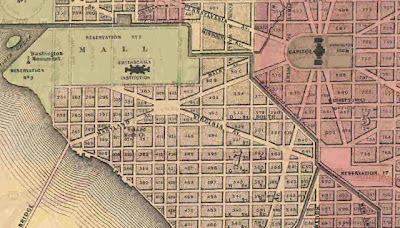 It joined the Potomac River just south of the White House, long before the western half of the National Mall had been filled in. The fanfare and hopes for the canal as a commercial success shortly faded, however, as silt and tidal nuances took their effect. The canal could only handle barges drawing a depth of three feet, eliminating most boat traffic. It was used moderately and suffered financial losses until the city purchased the canal company in 1831. Repairs fixed the problem of overflowing during high tide and empty portions during low tide. In 1833, an extension of the C&O Canal was completed to incorporate the Washington Canal. 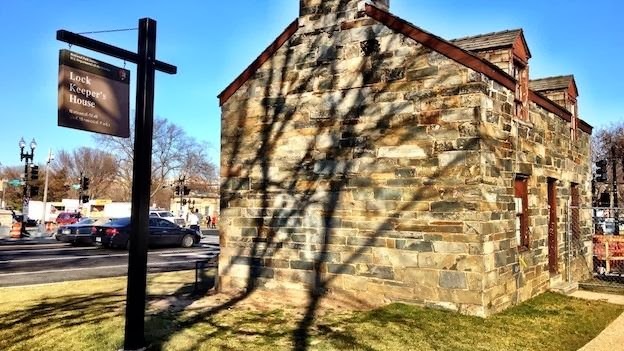 Around 1835, a lock keeper’s house was built at the eastern terminus of the C&O Canal, where the C&O Canal emptied into Tiber Creek and the Potomac River. 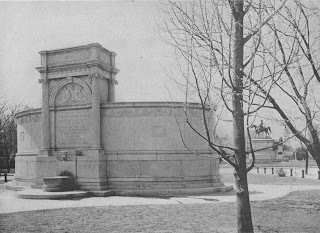 It still stands at the southwest corner of Constitution Avenue, and 17th Street, NW. The canal was cleaned and dredged in 1849, but the city’s promise to provide work and matching funds to Congressional budgets for the canal never materialized. In an era when most residents did not know how to swim, the canal provided a death trap to hundreds, especially young curious children or those wandering the city after a visit to a local saloon. Various proposals were introduced to either rehabilitate the city canal or fill it in. In 1871, the city’s controversial head of the Public Works Alexander “Boss” Shepherd had the Tiber Creek portion of the canal be covered over, which took years to complete. The new street that was constructed over this portion of the canal was initially designated as B Street, NW, but is known today as Constitution Avenue, NW. The southern portion of the Washington City Canal remained open for years afterwards, but eventually was also paved over. 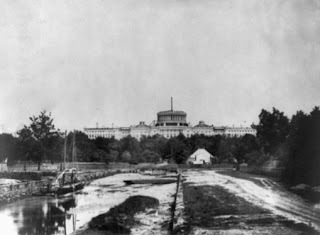 A street constructed south of the Capitol over that section of the canal now connects Independence Avenue, SW, and E Street, SE. Formerly designated as Canal Street, the northernmost section of the street was later renamed to Washington Avenue in commemoration of the state of Washington. 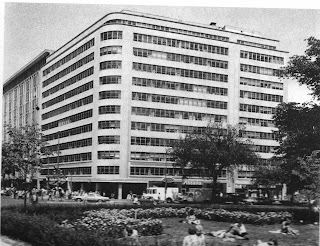 Unknown to most office workers today that traverse K Street and Connecticut Avenue is that up until the 1920s, what is now high rise office buildings was once the most socially important residential neighborhood of the city. Oversized mansions and spacious lawns lined K Street in the nineteenth century. 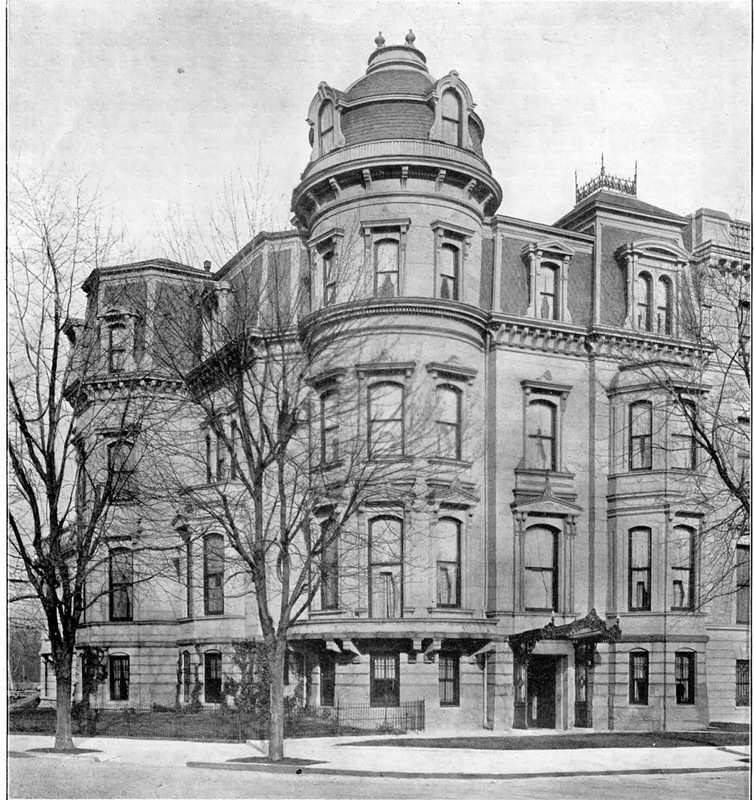 Three of these were built at 1701 to 1705 K Street facing Farragut Square that were designed in 1873 by Adolph Cluss, who would occupy the center townhouse himself; the elaborate Second Empire corner mansion (left) was built for Alexander “Boss” Shepherd, but purchased later by two very socially prominent families. Much has been written and attributed to Gov. Alexander R. Shepherd (1835-1902), who made a fortune in real estate speculation in this city following the Civil War. He became infamous during his tenure as the head of the Board of Public Works beginning in 1871, directing $30 million in contracts to close acquaintances before becoming Governor of the District. However, the depression of 1873 and corruption charges by Congress led to his removal from office in 1874, and personal bankruptcy. With the mansion being just a year old, it languished in the court system until the owner of a $45,000 private mortgage note on the house, George Seckel Pepper (1808-1890) of Philadelphia, right, petitioned to obtain title to the house in 1876. The Shepherd legacy reappeared, however, when it was discovered that his note only covered the front portion of the house, and excluded a twenty foot extension of the house that featured a picture gallery. The court also discovered that Shepherd had also obtained a $35,000 mortgage from Mary J. Gray for the same property. The legal situation took almost two decades to resolve, at which time the house was leased to the Russian Legation and as a residence for its Minister. Pepper eventually gained title to the house, but not until 1890. He was a philanthropist and lawyer who had graduated from the College of New Jersey in 1827. He was left a large estate by his father and devoted himself to its management and to philanthropic work focusing primarily on the financial concerns of Philadelphia He also served as the President of the Academy of Music and of the Academy of Fine Arts, and upon his death, bequeathed half of his $2 million estate to the University of Pennsylvania, the Free Library, and the Academy of Art. 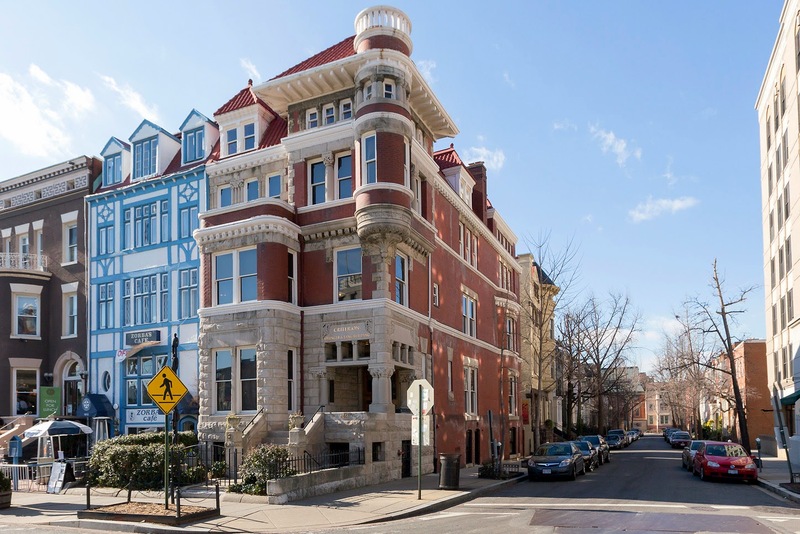 The corner mansion at 1705 K Street was sold in 1890 to General William F. Draper (1842-1910), the same year he married his second wife, the former Susan Preston. Draper was a well known Union General during the Civil War. Susan was the daughter of Major General William Preston of Kentucky, a Major General in the Confederate Army during the Civil War. This is perhaps the only case on record of a General of the Union Army marrying a daughter of a General of the Confederate Army. To tie the families even closer, Susan’s sister Jessie married William’s brother, George Albert Draper. 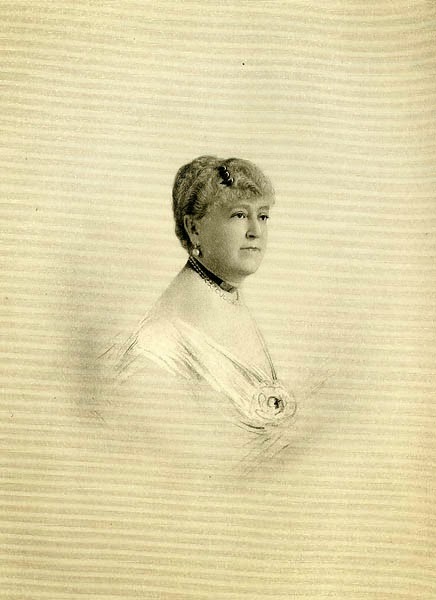 William’s first wife was Lydia D. Warren Joy Draper, whom he married in September of 1862 and had five children; William Franklin Draper Jr., George Otis Draper, Edith Draper, Arthur Joy Draper, and Clare Hill Draper. Lydia died in 1884. Draper spent four years in the Civil War in a remarkable career that eluded both serious injury and death. In the Burnside Expedition he became signal-officer on the general's staff, engaging in the battles of Roanoke Island, New-Berne, and Fort Macon when he was promoted first lieutenant and returned to his regiment. In August, 1862, he was commissioned captain in the Thirty-sixth Massachusetts and went through the rest of the Antietam campaign and battle of Fredericksburg, and was then sent to Newport News. In June, 1863, he joined Grant's army at Vicksburg, taking part in the capture, and subsequently in the march to Jackson and the fighting in that locality. His regiment was reduced, from fighting and sickness, from six hundred and fifty in June to one hundred and ninety-eight in September. The war over, he then engaged in the manufacture of cotton-machinery, forming a company with his father called George Draper & Sons. A mechanical expert, he received a record fifty patents on various implements and machinery that created a fortune. 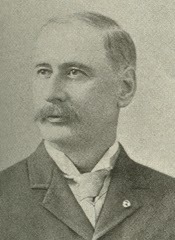 He served as colonel on the staff of Governor John Davis Long from 1880 to 1883, and was elected himself as a Republican to the Fifty-third and Fifty-fourth Congresses (March 4, 1893-March 3, 1897). He was also appointed an Ambassador and Minister Plenipotentiary to Italy from 1897-1899. His daughter Margaret from his second marriage met and married Prince Andrea Boncompagni-Ludovisi-Rondinell-Vitelli of Italy in a lavish ceremony at the K Street house in 1916. William Draper died before the wedding, however, on January 28, 1910. He was interred in Hopedale, Massachusetts, where he maintained a summer house. 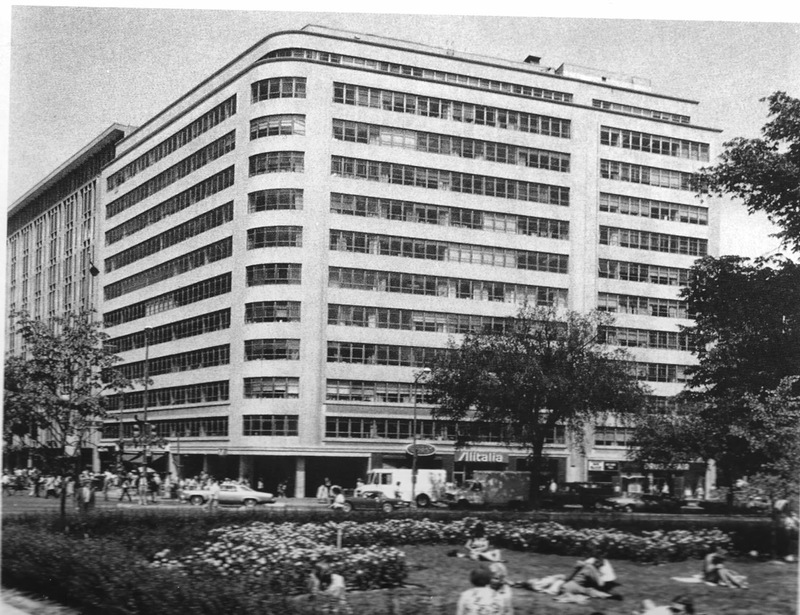 The K Street houses were all converted into office space in the 1920s, and were razed in 1952 for the construction of the present day office building; itself being renovated several times from its original facade (right).